A large Ute medicine tree, or culturally modified ponderosa pine, is seen at Target Tree Campground in the San Juan National Forest in La Plata County. While prehistoric ancestral Puebloans left thousands of archaeological sites across the Southwest, the historic Ute presence is harder to determine. 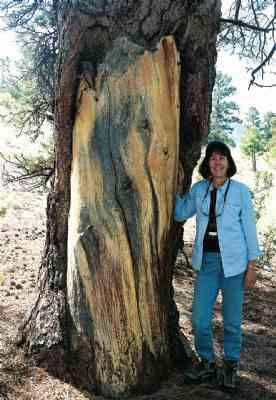 The secret is in tall ponderosa pine trees that have been culturally modified or peeled, resulting in oval scars. Ancestral Puebloans left stone structures. 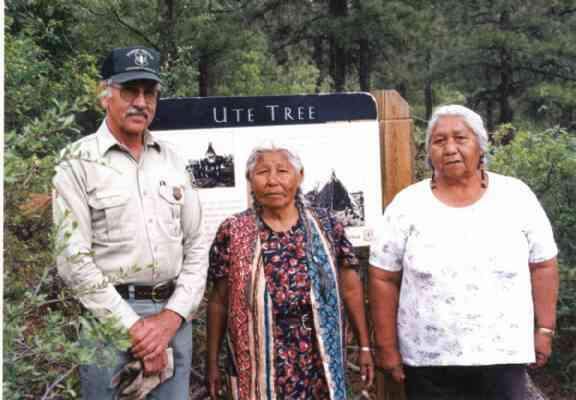 Utes and other tribal peoples left a living legacy among the pines. 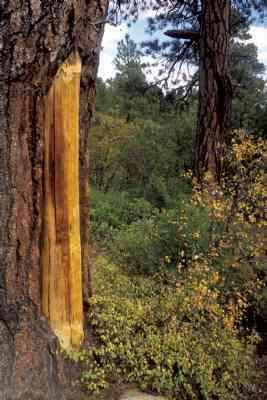 Lightning strikes on ponderosa pines also leave scars, but they are generally longer, demonstrate evidence of fire, are narrow and sometimes are called cat's eyes because felines have dark, vertical irises. Ute medicine trees have much wider scars and show evidence of ax cuts horizontally along the bottom of the tree. On tall ponderosas, the scars can be centuries old, 6 feet high, and represent a unique cultural and archaeological resource that proves Native American use of forested land from the 19th century and earlier. When the trees were young, Ute bands on horseback would have visited forests and cut into the pines in early spring as an emergency food source to extract the protein-rich cambium layer underneath the bark. During times of dietary stress, often in early spring when game was scarce, Ute women and children used a special debarking stick, axes or knives to peel the trees and reach the cambium layer, which tastes like soft cookie dough. 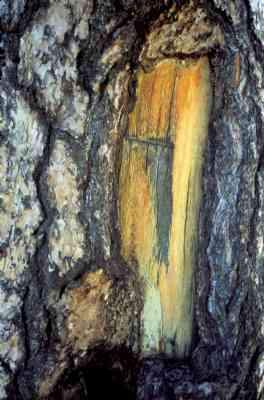 The cambium layer of living cells between the inner tree and outer bark help with tree growth and contain sugars, starch and minerals, depending on the soil. Archaeologist Marilyn Martorano notes that one pound of cambium is the equivalent of 600 calories and is high in fiber, calcium, protein, carbohydrates, magnesium, iron, zinc, vitamin C and equal in food value to nine glasses of milk. Now that's a health food! Fragments of animal horn and metal, including baking powder can lids, which were peeling tools used by Native American women, have been found at the base of peeled trees. Peeled ponderosas also acted as medicine trees. The material was used to create poultices for deep cuts and scrapes, which allowed human skin to heal without infection or scars. It also was used as a drink for disorders such as tuberculosis, colds, heart trouble and rheumatism. The resource-savvy Utes used select ponderosas for food and medicine and to sustain and nurture their young children. They created ponderosa pine cradleboards to keep infants warm and tightly secured. Ute women pulled the inner layer from the bottom up and then cut the soft wood with knives to make cradleboards for infants. Pine became the backboard, with leather later sewn onto a willow framework. Peeled pine also served as food trays. 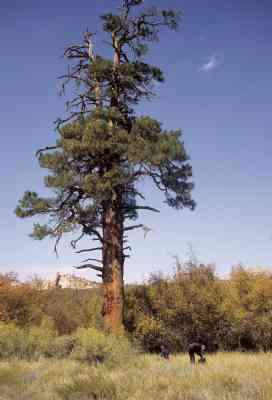 Because Utes used ponderosas for multiple purposes, such culturally modified trees are known as medicine trees. Some of the trees have numerous scars, indicating repeated use over years. Martorano explains, "If a tree was peeled once and then peeled again at a later time, the existence of the first scar probably affected the decision to peel the same tree again. Perhaps it was easiest to begin peeling the bark adjacent to an existing scar, or if the bark substances were used as food or medicine, it is likely that an existing scar would indicate that the bark of the tree was useful or edible." One place where the Utes returned again and again is now a public campground. In La Plata County between Hesperus and Mancos at Target Tree Campground on the San Juan National Forest, 40-year veteran forester Lloyd O'Neil worked with Ute Mountain Ute, Southern Ute and White Mesa Ute elders to dedicate and rename the campground. They told him, "Yes, this was definitely a Ute campground. We camped here on our way from the winter grounds to our summer area, where we gathered berries and fruits." The name of the campground, translated from the Ute word ivikukuch, means "target tree" or "tree you shoot at," which was a large, peeled pine. Though the peeling practice is centuries old, with tree core dates varying from the late 1700s to the early 1900s, identifying and mapping these peeled pines by U.S. Forest Service archaeologists and cultural consultants is relatively recent. Groves of such trees have been found at Florissant Fossil Beds National Monument behind Pikes Peak west of Colorado Springs, at Great Sand Dunes National Park and Preserve near Alamosa, in the upper Rio Grande Basin, and along the La Plata River near the old Fort Lewis campus, as well as in many other places. At Great Sand Dunes, Fred Bunch, chief of resources for the National Park Service, says, "As park managers, it is quite a challenge to manage living artifacts. These trees have been culturally modified and have a story to tell. They will go through their life cycle and then return to the earth." The Indian Grove site within the national park has 72 mature ponderosa pines, many with large scars peeled between 1816 and 1848, and it is listed on the National Register of Historic Places. Bunch adds, "It is important to collect as much information about these trees now to share with future generations." Modifying ponderosa pines may not be an exclusive Ute tradition. Dr. Adrienne Anderson, archaeologist for the National Park Service's Intermountain Region, cautions that other native groups are documented to have used the Great Sand Dunes and Florissant Fossil Beds national monument areas, not just the Utes. She explains, "In Great Sand Dunes, we have Puebloan, Apachean, Ute and Plains Woodland ceramics from the same site. So who is to say which group produced which CMTs, or culturally modified trees?" She says, "The Jicarilla Apache continue to use the park for traditional collecting activities, and their elders indicate that the tribe has a long history of utilizing the ponderosas." Medicine trees are also found in the red rock forests of southeast Utah, sometimes as single trees close to the Bears Ears and also in groups of twos or threes near Allen Canyon, on the west side of the Abajo mountains. By 1923, White Mountain Utes received allotments of land in Allen Canyon they had used culturally for generations. Peeled pines prove it. They are living cultural artifacts worthy of study and preservation throughout the red rock forests. Groves of such trees need protection and should be included on resource management plans for fire mitigation. They need to be mapped, so the pines are not accidentally cut down in timber sales or damaged in prescribed burns or fuel reductions. Ute medicine trees can teach us much about the age-old Ute use of forests, and they forge a living link from the present to the past. Across the Southwest, ancestral Puebloans left us stacked stone walls and dozens of cliff dwellings, but deep in the bottoms of canyons and in quiet meadows at higher elevations are equally subtle links to Native Americans and the living landscape. "One pound of cambium is the equivalent of 600 calories and is high in fiber, calcium, protein, carbohydrates, magnesium, iron, zinc, vitamin C and equal in food value to nine glasses of milk."